Petition to help free the Bundy and Malhaur reserve men currently incarsarated. July 19th, 2018; Nevada judge Gloria Navarro has sentenced Todd Engles to an additional 14 years imprisonment over and above the time he has already served. I am in hopes that this thread will be used to help gather and collect the names of ALL the men involved in both the Bundy ranch stand off and also the Malhaur Wild Life reserve in Burns Oregon. Several men have already been sentenced to extremely long prison terms by the judges from Nevada and Oregon. If the friends and patriots who support these men are ever going to present any type of petitions to President Donald Trump then it should include the names and places of ALL of these men. It should include the names of all the judges and prosecutors and anyone else that was involved is prosecuting and sentencing these men. This page and thread is not intended to collect the names of these judges and prosecutors so that it can be used to threaten or cause physical harm or danger to these people, but so that if and when possible these people may be removed from the offices or our Federal and State judicial systems. We believe these people are corrupt and abusing the authority of their offices for their own personal BIOS and animosity and political hatred for America and our current President Donald J. Trump. This kind of corruption and abuse of legal authority must be stopped, these men did no more than to stand up against the corruption of the Federal Government to prevent the intended murder of the Bundy family and also to protest the sentencing of Dwight and Steven Hammond who the President has already pardoned. 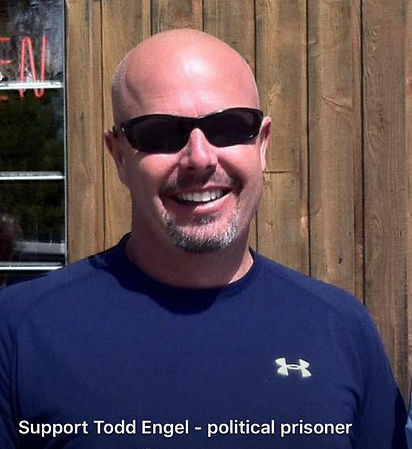 It is now time to free Todd Engles and all the other men who are currently incarcerated at the hands of these corrupt Federal officials. Help us gather those names so that proper petitions can be presented to free ALL of them. People wishing to contribute to the lists will have to join the forum, It's free, no membership dues, This is NOT a go-fund-me page. I will accept memberships as I see them. This is NOT the actual petition, this is meant to be a list of the name of ALL the men incarcerated or pending sentencing. Please if you can list the prisoners/accused names, what trials they were effected by, and the names of the judge and prosecutors involved in each case. If possible please include the locations of where these men are being held. GOOD JOB OLE BUDDY..Have you heard from the Colonel..
Where are they now, Who them there? We need all the names and the judges and prosecutors. Todd Engle, Jerrry DeLemus, Gregory Burleson, Jake Ryan, Ryan Payne, Blaine Cooper, Duane Ehmer, Darryl Thorn, I will see how many i can find. Here is a link to one petition someone started on the White House petition web site. This may be useful and we should try to use it and we may want to help creat another one. Please lets do all we can to help these men. This is Jerry DeLemus...He was Trumps NH Veterans Representative. He stood up at the Bundy Ranch to protect the Bundy family. He is a Marine that served his country with Honor. He is imprisoned in Devens Mass. for preventing a massacre at the Bundy Ranch. This man should be free, he stood up for the Constitution. he is one of our Brothers and we need to do what we can to obtain his freedom....God Bless this man that stood up and risked his life for what he believed in...he is a good man. Nevada judge Gloria Navarro sentenced Jerry DeLemus to 68 years. Below is the public statement of Militias, III%ers and patriot groups from across the country outraged by Judge Navarro's sentence of Todd Engel. I thought all members of the Bundy trial had been released and pardoned? That is not true? No Sir, About 14 members who stood up against the BLM are still in Federal prison. Todd Ebgles, Jerry DeLemus, and Ryan Payne and Jake Ryan are among them. Please send Jerry DeLemus a letter or card. His birthday is November 25th.